If you think the instant availability of all of the music, all of the time has killed off compilation albums... you're completely wrong. Apple Music has just revealed its biggest albums of the year, and the Top 10 includes four entries for the Now That's What I Call Music! series. Now 95 is the most popular collection, coming third in the year-end chart. Now 96, Now 97 and Now That's What I Call Christmas also feature in the countdown. The list combines figures from Apple's streaming service, Apple Music, and the iTunes download store. Only Ed Sheeran's Divide and Rag N Bone Man's Human outsold Now 95, which features such hits as Drake's One Dance and Clean Bandit's Rockabye. Chart expert Fraser McAlpine believes the key to the series' success lies in its simplicity. 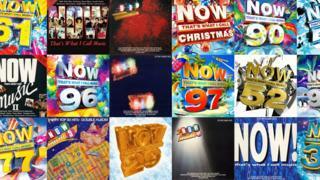 "The Now compilations are easy to digest, reliable guides to a constantly changing pop landscape," he told the BBC. "Over the years, each new edition has become a time capsule, charting the changes in the nation's favourite songs, like a biannual report. "So this year, we've seen huge rises in Ed Sheeran and Dua Lipa's stock, while Justin Bieber's shares remain buoyant." The Now series has been running since 1983, when the first edition included Bonnie Tyler's Total Eclipse of the Heart and UB40's Red Red Wine. Although compilation albums had existed before, they usually consisted of cheap cover versions or songs from a specific record label. The Now series' masterstroke was to broker a deal whereby two companies, Virgin and EMI, collaborated on the tracklisting. The first album spent five weeks at number one and spawned an imitator - called The Hits - from rival labels Sony BMG and Warner Music. By 1989, the commercial clout of these compilations was so strong that a separate chart was launched to stop them clogging up the Top 40. These days, the Now anthologies continue to sell in massive numbers. Now 95, released last November, was the UK's biggest-selling album of 2016, outperforming even Adele's 25. The series also exists on streaming services like Spotify and Google Play, where playlists of the albums' tracklistings have hundreds of thousands of followers. Fraser McApline notes that the compilations are "more carefully curated than it may seem". "As well as noting the unavoidably huge hits of the moment, there are always one or two forgotten gems that deserve further exploration, with the benefit of hindsight." Peter Duckworth, co-managing director of Now Music, said the series' success showed "the role of curation" had become "ever more invaluable". "This chart shows how important a long-standing, trusted and well-loved brand like Now is in giving people the confidence to trust the curation," he told the BBC. Outside of the Now series, Ed Sheeran dominated Apple's year-end charts, with Shape Of You, Castle on the Hill and Galway Girl all making the Top 10 tracks of the year. "Really happy everyone has enjoyed the album this year, thanks to all who streamed and downloaded," said the star after hearing that Divide had become the year's biggest album. Disney's Moana was 2017's most popular movie, while the seventh series of Game of Thrones topped the TV charts.